My-Alia : Happy Mother's Day (08) ! Yesterday was a Mother's Day. 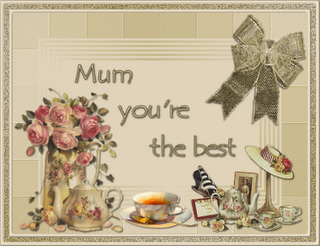 So, happy mother's day, mak! heheh..
(gold = bracelet/pendant/neclace) We went to Jaya Jusco, but I forgot that gold has reached about 100 gms = RM 120 (or something like that..). So, if we buy a pendant for mom, which costs around Rm 300, and guess what..? Pendants for that price are SOOOOOO SMALL..
Actually the present is the perfume (far left). It was Pure Poison ~ Christian Dior... I've always love this perfume, but it is so expensive so i guess for mom, what the heck.. 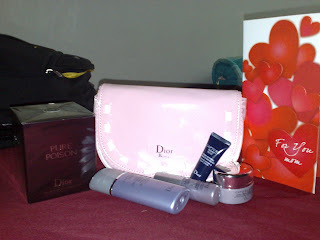 They gave us the pink bag (inside it were a few creams etc..). Oh ya, Mama Ryan gave this pic to upload on our blogs.. Kinda cute, though.. Thanx! Oh ya, at nite, we all went for a treat! Chicken chop! These are 2 models.. the rest of pics are quite dark.. (biasa la, handphone murah je..) So, i just upload this one, k..
Another thing... ALia is here.. smiling.. and vomiting a bit.. hahah.. on Uda's lap..
Amik munga pink kat blog saya tak? tq.. da nengok da bunga tu.. besar tul! 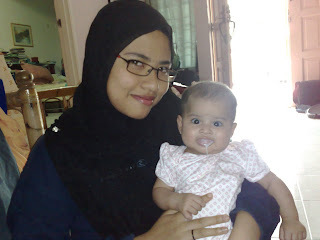 yang ni alia cumil sket..
tp nape mke acu cm org tue eh?
. 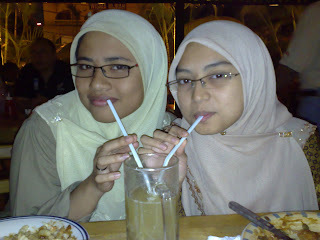 :: hei..can i ask u something..the two gurls that sipping the drinks..on the right, is that noraini abu bakar??
. :: oic..bukan noraini la ye? ?sorry..sbb rupa dia mmg sebiji la sama dengan kawan saya yg nama noraini..
x pe, in fact, saya pun ada kwn nama cm tu.. ntah2 org yg sama.. hihihi..